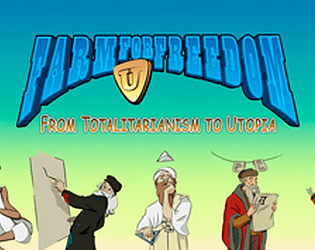 FarmForFreedom is a clicker game that urge you to boost the ultimate change in the world! You can now experience FarmForFreedome with a better gameplay and full-feature (well maybe we've missed one-or-two) and also on MAc and Linux Versions! Lampwave Studio was slow but we've finally finished polishing the game we so passionately engage on to the #ResistJam 2017 (we're already anxious for 2018 edition)!! Later today, we'll have both a Mac and Linux version able to download with the already bug-fixed windows port. So stay tunned! Now that it is done, we would like to thank all #ResistJam team for coming up with such a fun and rewarding Jam to develop on, and also for all the Hype it brought both to developing and gamers communities, bless you all! Also we want to congratulate all developers for their work witch makes us very proud of having participated with! Finally we would like to wish for the best to all Itch.io community and supporters, and please keep resisting our inner-devils, for the sake of a "better world, for you and for me and the entire human race", as the song goes!